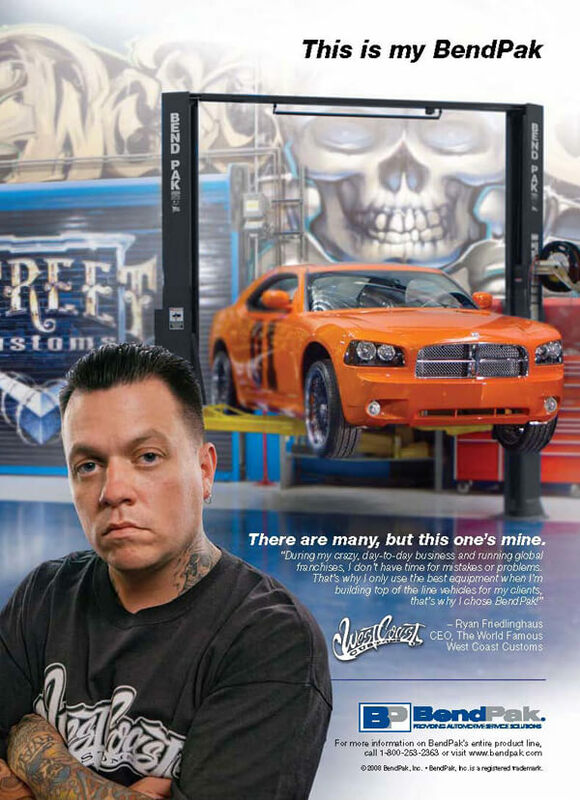 Too often in the DIY auto ​hoist market, manufacturers rely on the dissemination of inaccurate information and creative advertising ploys in order to sell inferior products. 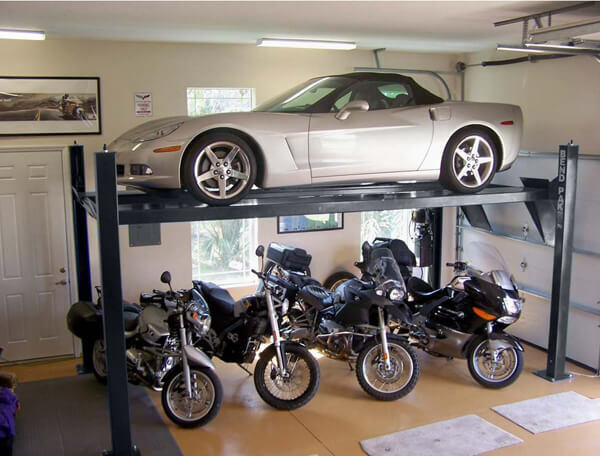 BendPak recommends that anyone in the market for an auto hoist such as a four-post hoist thoroughly conduct comparative research of all the options before ultimately deciding which hoist to purchase. In an effort to assist the customer in navigating the various factual gray-areas and minefields of misinformation, BendPak compiled this study for your consideration. 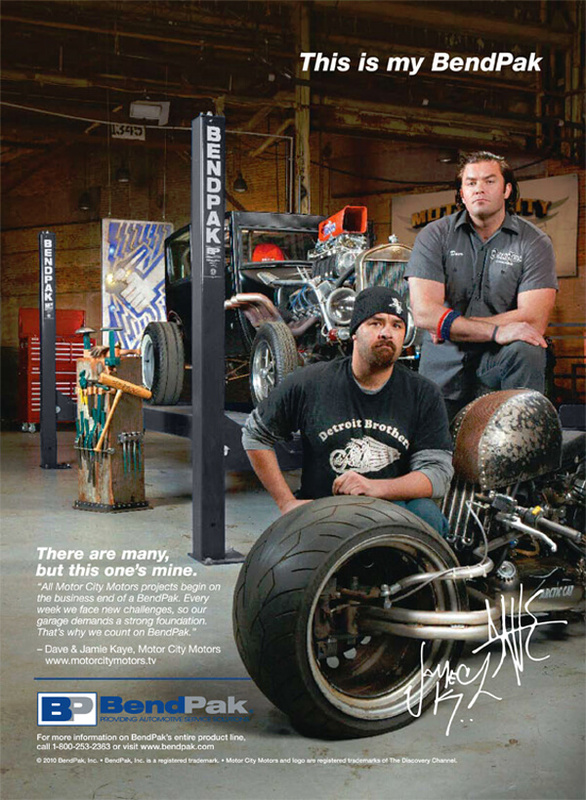 BendPak has 72 unique ​hoist models ranging from lightweight to super‐duty. 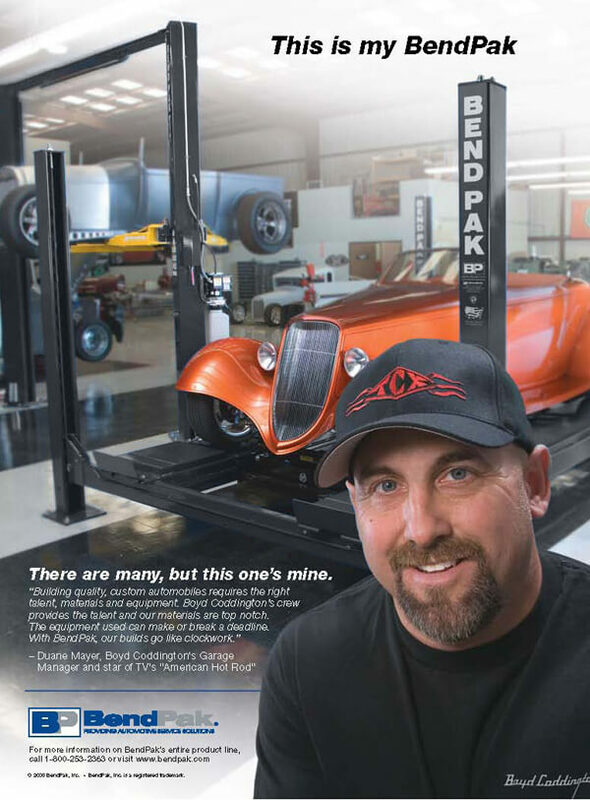 Many "hobby" ​hoist companies could not come close to a fraction of lifts BendPak sells globally. Investigate thoroughly on the web using several search engines to see how many pages other, lesser‐known hoist companies appear on when compared to a true world‐leader like BendPak. 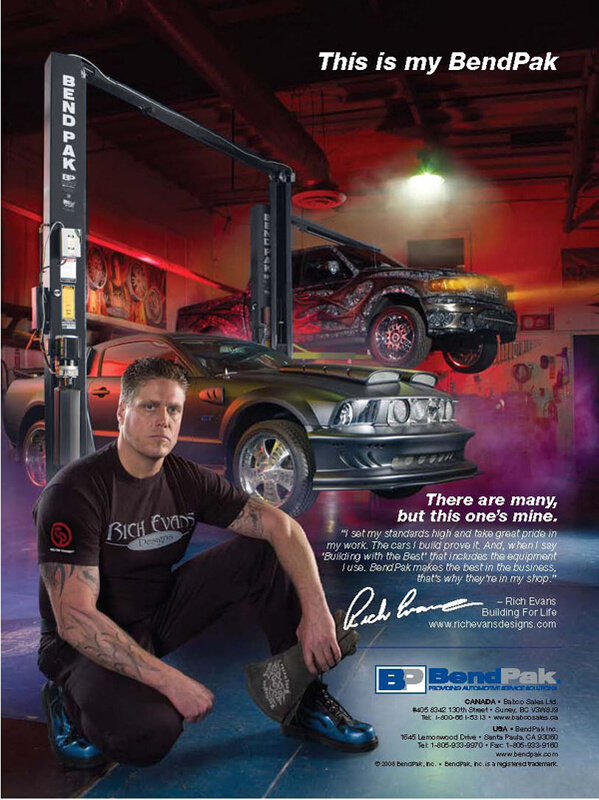 Many valuable options are available for your BendPak four‐post hoist. 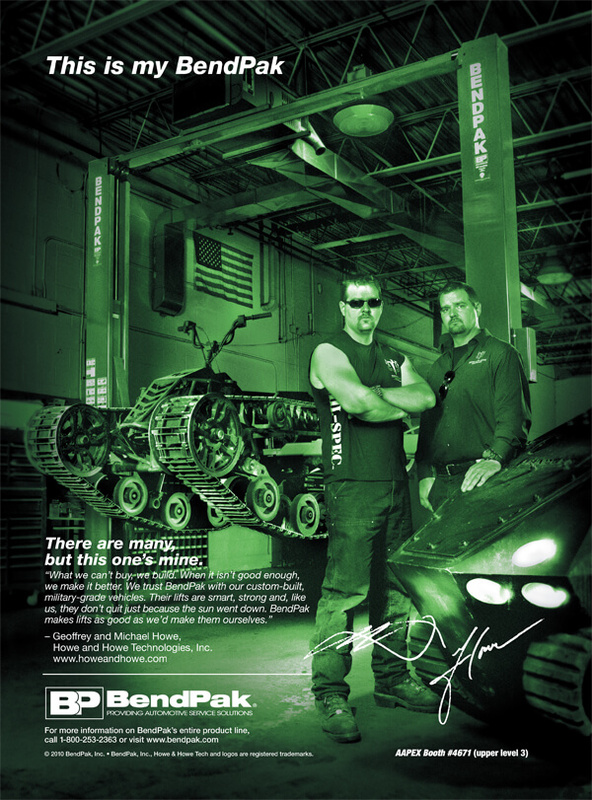 BendPak has over 650 installation and service centers located in the United States. 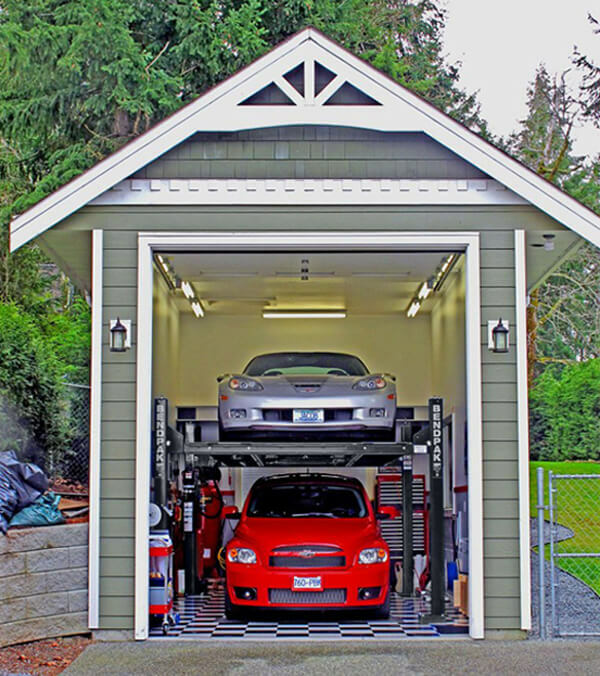 These fully equipped installation and service centers have specialty service fleets that make a living installing and servicing large car dealerships, national accounts, auto repair centers and occasional auto enthusiasts and DIY'ers. BendPak has a complete staff of full‐time engineers who do nothing but design, test and evaluate lift systems. 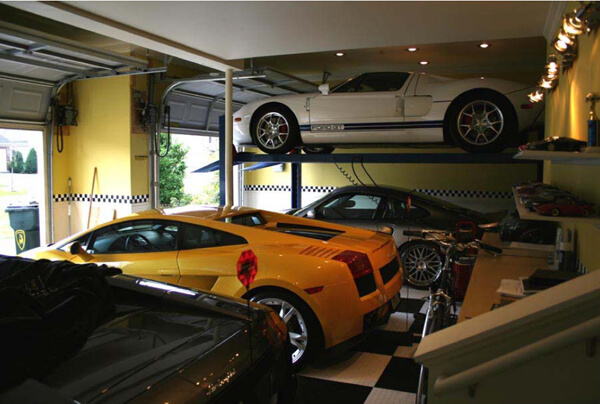 BendPak car ​hoists have changed and evolved over the past 30+ years, not because they want to sell you on a new model every few years, but because they are constantly improving the structural integrity and design of our ​hoists to meet ever‐changing world standards. On the surface, many hoists look "engineered", but what lies under the surface? 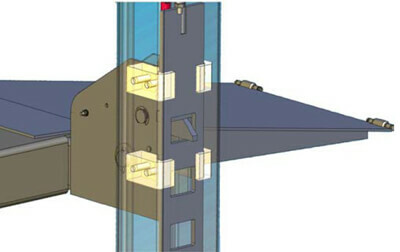 All BendPak hoist designs are computer modeled for function and structural integrity, undergo simulation of applied forces, axial force, bending moment, etc. 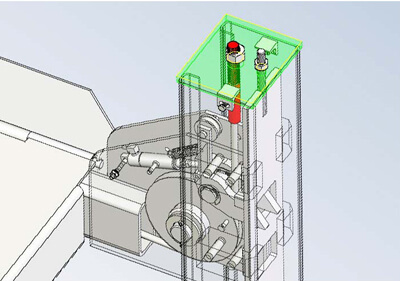 using Solid Works Cosmos and other FEA programs. After the design is sound, they proceed with actual destructive (physical) testing. There is only one real national ​hoist standard for quality and safety: OSHA endorsed ANSI/ALI ALCTV‐2017. 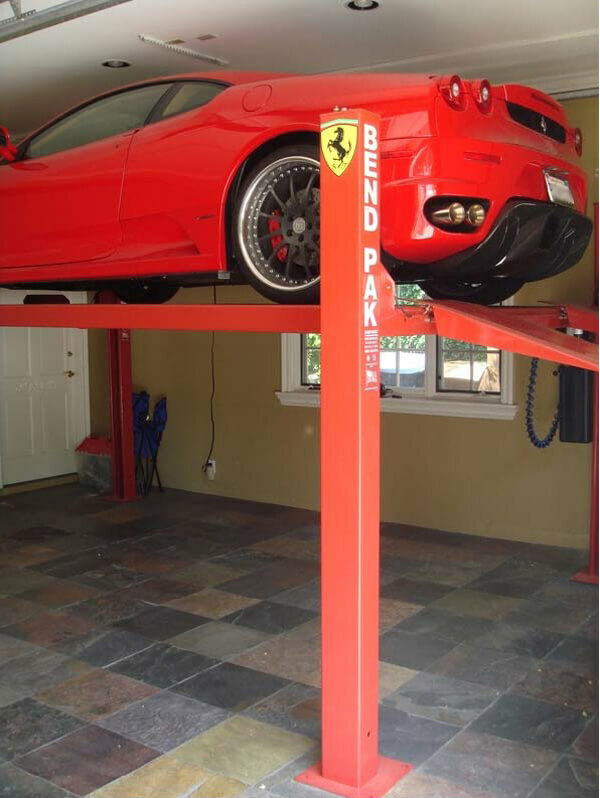 If you don't see any reference to this standard, then ask yourself if saving a few extra bucks on a non‐certified hoist is really worth jeopardizing the safety of you, your loved ones and your valuable equipment. BendPak certainly gives you value, but it’s more important to us that BendPak gives you peace of mind. The only reason a car ​hoist is not granted ANSI/ALI ALCTV‐2017 certification is if it does not pass the standard. This could be due to a number of factors, including a lack of a slack‐cable lock system, missing a substantiated engineering report from an accredited PE (professional engineer) verifying that all components could withstand a load of 150% capacity with no permanent yield or deformation of any kind, their absence of an ample cable guard to prevent unintentional displacement and more. Do not take the risk. These certifications exist for a reason. Claims that state "Meets or Exceeds Standard ANSI/ALI B‐153.1" are meaningless. This standard no longer exists. Claims that state "Meets all ANSI Standards" are meaningless. No other standards apply to hoist construction except ANSI/ALI ALCTV. In order to meet ANSI/ALI ALCTV, Certification is required. Look for the Mark. Claims that state "Meets all OSHA Requirements" are meaningless. 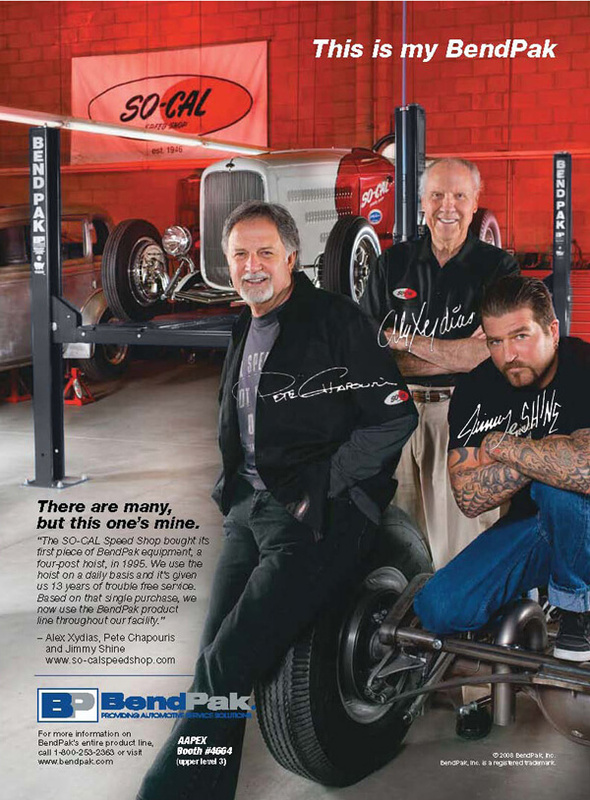 OSHA has no requirements governing automotive hoists, but they do write citations that apply to them. OSHA does this under the General Duty Clause and recommend to those cited that it would be prudent for the cited party to follow the directives in the various standards developed by ALI. Any claim that implies "This hoist is ALA Certified" is worthless. 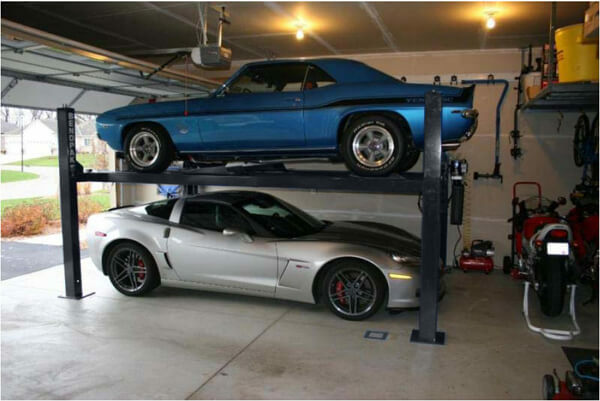 ALA (Automotive Lift Association) is reported to be an organization of suspect lift suppliers with no endorsement by ANSI or OSHA. ALA appears to be purely fictitious and created merely to confuse purchasers, users and inspectors. Any claim that implies "This lift is MAMTC Certified" is worthless. 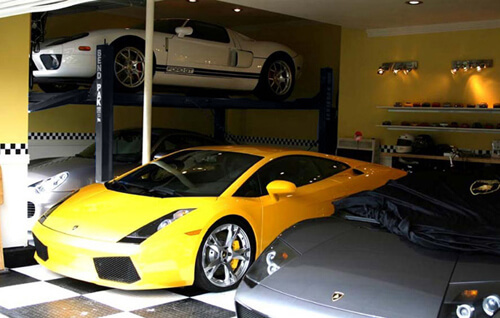 MAMTC (Mid‐America Manufacturing Technology Center) is a unit of Wichita State University, which in one instance attempted to certify a car hoist model. Test Reports on MAMTC letterhead stated that a particular lift complied with ANSI B153.1 – 1990. Of course, this is meaningless because MAMTC is not a NRTL (Nationally Recognized Test Facility), and the standard cited is obsolete. Even if a ​hoist is ANSI/ALI‐2017 certified, ask yourself if you want to do business with a company that tries to mislead you with padded, false certification. 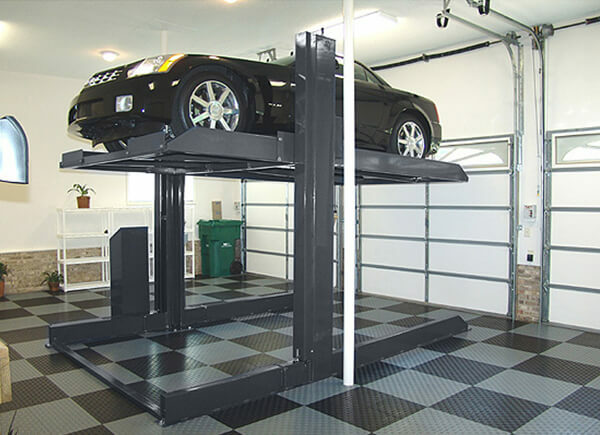 BendPak car hoists incorporate UHMW (Ultra‐High Molecular weight) Polyethylene glide blocks to maintain proper alignment of lifting and safety components. UHMW is often referred to as the world's toughest polymer. 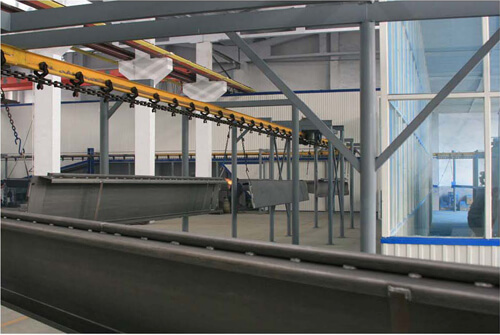 A linear high-density polyethylene, UHMW has high abrasion resistance as well as high impact strength. 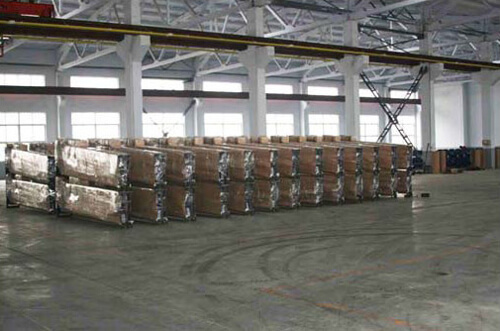 UHMW is also chemical-resistant and has a low‐coefficient‐of‐friction, which makes it highly effective in a variety of applications. BendPak glide blocks are simply guides that keep the cross tubes and safety ladder centered within the column and minimize sway. 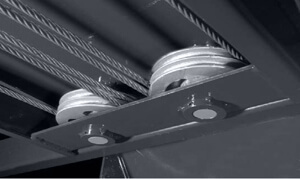 BendPak hoists feature cable sheaves that are precisely centered within the cross tube to ensure that the cross tube stays level, thereby eliminating side loads of any kind. Lesser‐known hoist brands employ cross tube sheaves and axles that are located outside the cross tube body, forcing the cross tubes to twist or rotate away from the sheave as the lift raises. This twisting occurrence tends to develop side‐loading on their cross tube components and plastic sliders. All of BendPak car ​hoist cylinders use internal flow‐restrictors to prevent rapid fall in case of a hose or fitting failure. This is a worldwide safety standard that is required for all commercial lift manufacturers. 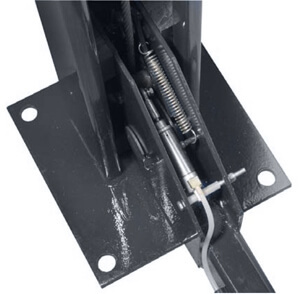 International auto lift standards prohibit the use of quick‐disconnect fittings on vehicle or personnel lift applications. Quick disconnect fittings have spring loaded ball‐in‐seat components. If the ball does not "seat" like you expect it due to contamination or a faulty ballseat, there is nothing to shut off the flow of oil and the uncontrolled descent of your hoist. Hose "blow‐outs" simply do not occur under normal use. As part of the ANSI/ALI ALCTV‐201​7 standard, all BendPak hoses have a 400% safety factor based on the pressure required to operate the lift at its rated load capacity. BendPak HD‐9 series hoist models feature a single, 3" diameter hydraulic cylinder hidden away under the runway for maximum performance, reliability and minimum elemental exposure. 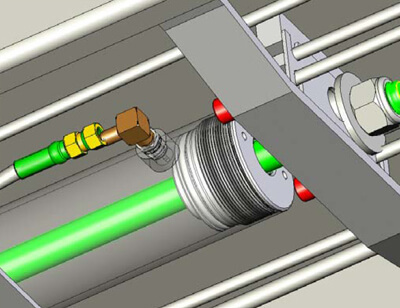 Our industrial‐grade hydraulic cylinders feature a one‐piece, pilot-fitted, machined steel piston wrapped with specially designed, pressure loaded U‐cup piston seals, backups and wear bands that virtually eliminates any fluid bypass. The micro‐smooth chrome‐rod is machined from high yield, ground & polished C‐1045/50 micro‐alloy steel and plated to a minimum of .001˝ diametrically, ensuring superior cylinder operation and life. Specially designed, high durometer, mechanically loaded rod seals virtually eliminate rod seal leakage and a specially formulated abrasion resistant urethane rod wiper provides exclusion protection. The welded cylinder body is made from high yield‐strength steel tubing produced to exceed ASTM specifications. This combination of superb base material and superior processing ensures straight, smooth and long duty-life cylinders. 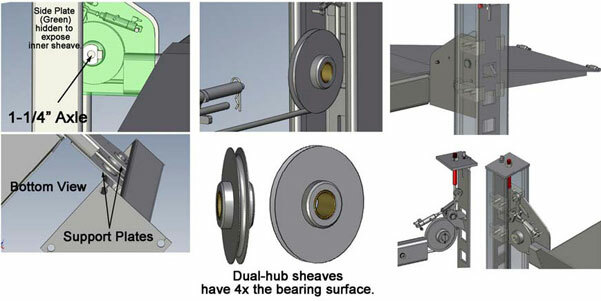 BendPak four‐post hoists employ eight independent safety lock devices: four primary and four back‐ups. 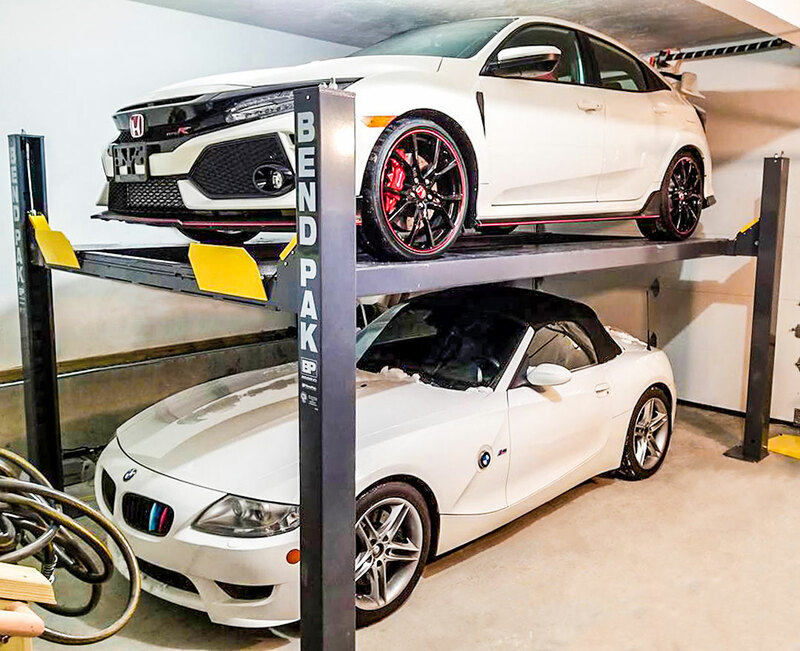 BendPak's adjustable ladder provides adaptability for unlevel floors, enabling your vehicle to sit safely in a level position even if your floor is unlevel—an important feature that many other car hoist brands lacks. 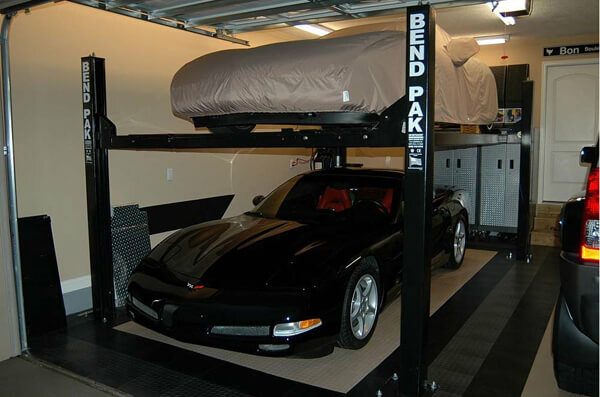 BendPak also features 13 adjustable lock positions to provide greater versatility and storage height coverage. 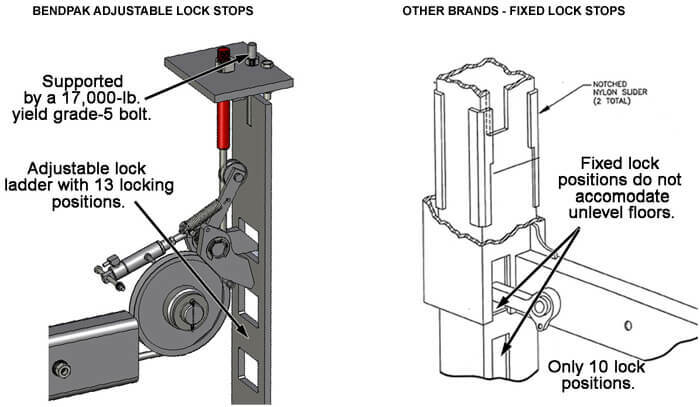 Our commercial-grade pneumatic safety lock system ensures that your locks release simultaneously every time. 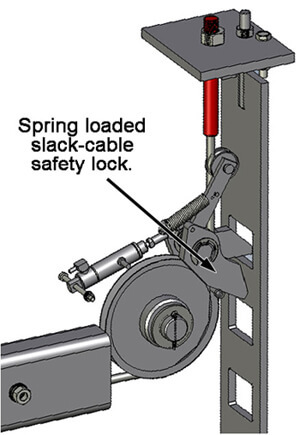 Other auto lifts use linkage rods to release the four spring loaded locks. That's a lot of resistance to overcome. That, combined with the accumulation of slop for all of the linkage points, means the safety lock furthest from the operator has a good chance of not being "pulled back" far enough. Think about what would happen if three corners descended and one stuck. The worst cause of lift failures or vehicle "drops" is the runways suddenly becoming unlevel due to a seized column or a stuck lock. Mechanical linkage systems are more prone to failure. 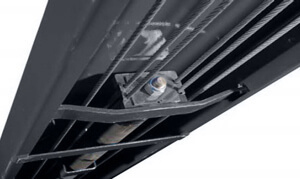 BendPak's cable block attached to the chrome rod features "outrigger" sleds that ride on the inside rails of the runways to ensure the cable block remains square at all times. 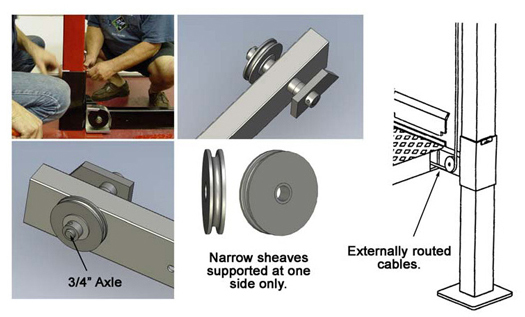 Hoists that do not incorporate this device can experience cable block misalignment (the cylinder rod tends to rotate as the cylinder moves, due to the inherent nature of the cables trying to "unwind"), which ultimately causes premature wear of cables and/or sheaves. Our 6" diameter cable sheaves are a tad bit on the large size, but these super-size sheaves will add years of service life to the lifting cables. The largest contributing factor for premature cable wear is bending fatigue as the cable wraps around the sheaves under load. 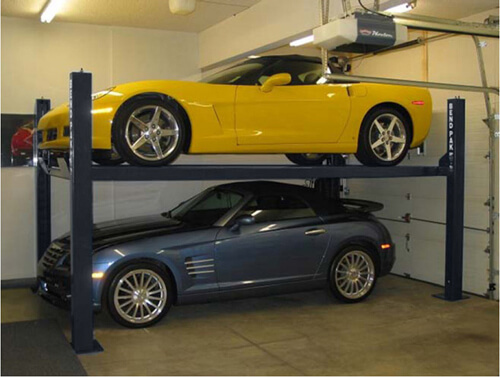 Each BendPak car hoist features a durable powder coat finish that gives the metal a high‐quality, extremely durable finish that can withstand even the harshest environmental or chemical conditions. Unlike other companies that claim to powder coat, we take pride in our meticulous process. First, all parts are visually inspected before being sandblasted and then washed in our five‐stage phosphate tanks. 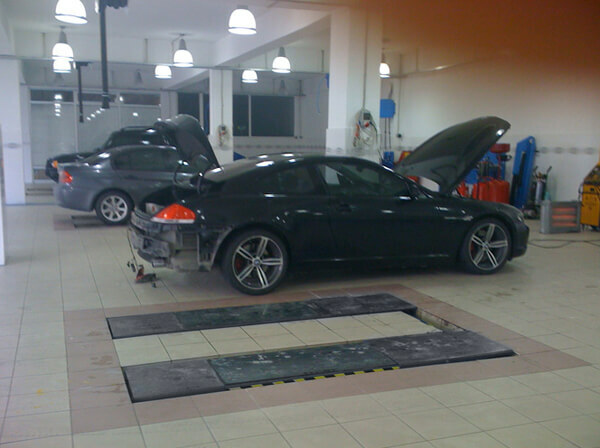 They're immediately dried to avoid rust production, then any surfaces and/or threaded holes that need to be masked or plugged are done so with high‐temperature masking tape and silicone plugs. The parts are then given a quick thinner wipe to remove any light debris or fingerprints before being hung on an electrostatically grounded conveyor line. The powder is applied using an electrostatic spray gun and "sticks" to the parts (similar to how dust sticks to a television screen). Once the parts are powder-coated, the carts are rolled into our curing oven and baked at 400ºF for 15 for 45 minutes. 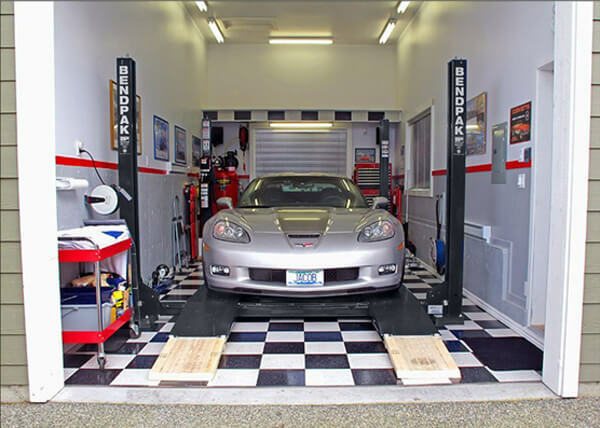 A BendPak car hoist is more visually attractive because they feature lifting cables that are routed internally through the cross tubes and columns. 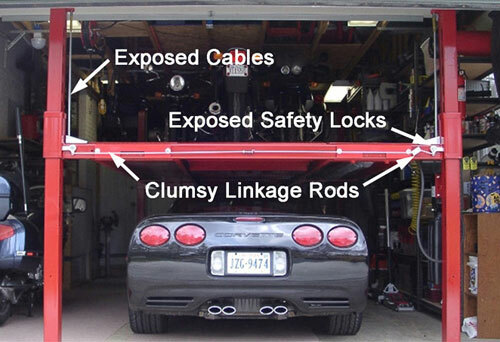 They are also void of clumsy linkage rods and external safety locks. BendPak has one of the largest inventories of auto ​hoists in the world, with over 3,000 ready‐to‐ship models available for immediate shipment. Our in‐stock units offer consumers a variety of ​hoist designs and capacities, as well as several options to choose from. 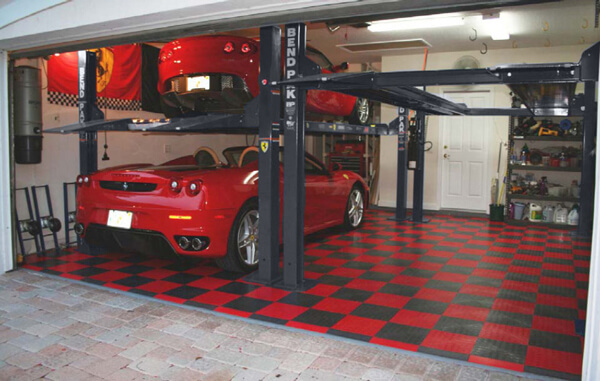 If we do not have it in stock, our experts can help you spec the specific hoist your job demands. BendPak customers are supported by a specialized service program known as Certified Service SM. Our fully staffed Customer Care Center (CCC) is available to meet all of your support needs, including highly responsive technical support; one‐on‐one communication with account representatives and technical experts; electronic data interchange (EDI); highly‐efficient logistics support chain; automated dispatch and communications system; tightly integrated system that allows incident management; and trouble‐shooting and reporting that is seamlessly provided to customers, regardless of location.